1 Day FLASH GIVEAWAY – Win 4 Tickets to Marvel Universe Live! Marvel fans, assemble! Marvel Universe LIVE! is taking the live entertainment experience to a whole new level, with a mind-blowing show unlike anything you’ve seen before. You’ll definitely feel the energy with cutting-edge special effects, pyrotechnics, aerial stunts, martial arts, motorcycles and more. It’s being hailed as the most technically advanced live show ever. Marvel Universe LIVE! will captivate audiences with an authentic and original story that brings more than 25 Marvel icons together on one epic quest at the American Airlines Center this weekend, January 31st-February 1st. To discover more about Marvel Universe LIVE!, go to www.marveluniverselive.com or visit us on Facebook and YouTube. 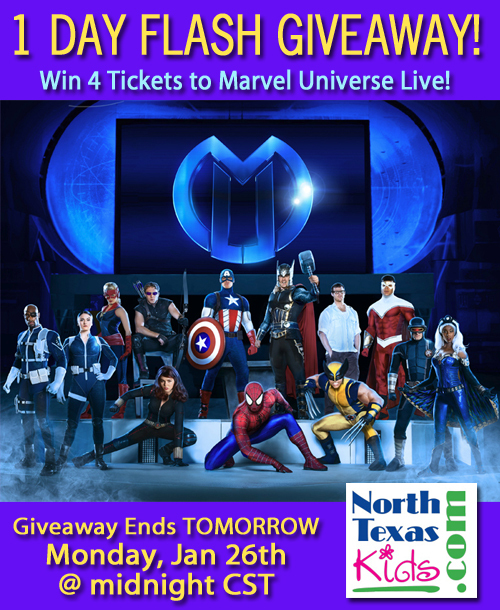 “Like” North Texas Kids on Facebook https://www.facebook.com/northtexaskids AND leave a comment below to tell us why you’d like to win 4 tickets for your family to see Marvel Universe Live! If you’re already a fan of NTK on Facebook, great! Don’t forget to leave a comment below. Contest ends TOMORROW, Monday, January 26th @ midnight CST. Winners will be notified by email (the one you use to leave the comment below) on Tuesday, January 27th and MUST RESPOND THE SAME DAY to be eligible; otherwise, prize will be forfeit. Tickets will be mailed to the winner on Tuesday. My 5 year is a Superhero fanatic! He knows all the villains, heroes and their backgrounds. He would be speechless if we were to win! My 4 year old son would go nuts to see this!! Fingers crossed!! My daughter is a big fan and would really appreciate it if she could go. For my Wife to take my Son while I am not able to do so because of work. It would be an awesome Mother Don date. My 8 year old is a huge marvel super hero fan. He would love this show. Thank you to all that entered the contest. Congrats to Kristi S. Enjoy the show !! !